Gov. Larry Hogan and House Speaker Michael Busch at bill signing Tuesday. “We’re going to fight to get those 100 troopers on the street, because I know you need them,” Hogan said. “I do know there are older citizens in their homes who hope to have community programs that won’t happen now, there are teachers in the schools that will have fewer teachers now, there are pregnant women that won’t have family health now,” Kopp said. 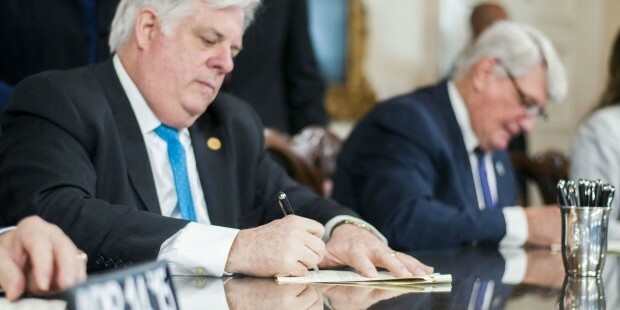 “Seeing you up here reminds me of the fact that the Speaker of the House refused to read our supplemental budget across the desk, the first time that has happened in 25 years,” Hogan said. Hogan thanked Hasenei for “proving the board right” in not granting a $20 million increase of grant money during the last BPW meeting. Instead Hogan insisted they find funds in existing contracts, which they did.